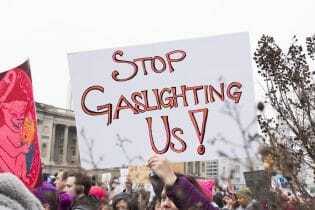 New Orleans Gaslighting is an interesting concept, but when I first heard the term, frankly, it meant nothing to me. Talking to psychologist and attorney Bryant Welch on Wade’s World gave me a much clearer understanding of the concept and its dangers. According to Wikipedia “the term owes its origin to the 1938 Patrick Hamilton play Gaslight and its 1940 and 1944 film adaptations, in which a man dims the gas lights in his home and then persuades his wife that she is imagining the change.” The experience is common enough, but since none of us use gas powered lighting inside our homes anymore, the reference doesn’t prompt an immediate, “oh, yeah!” when you hear it. The term has become a standard in psychological practice and research studies, making it easier to morph into the polarized political environment of our times. I had associated the term more with the Fox News and Breitbart crowd, but Welch persuaded me that this was the state of play on all sides of the political spectrum. His book State of Confusion: Political Manipulation and the Assault on the American Mind was released in 2008 opening the window wide into the partisan divide around Obama’s election, but he has reissued the volume now perhaps to even more relevance in the Age of Trump. Welch would not be the first psychologist to argue that Trump is somewhere dangerous on the mental health spectrum, but his argument is more pointedly about how some of what seems so bizarre about Trump and his tactics, lies in his masterful attempts at gaslighting the public, particularly his base. Take for example the constant lying. Rather that that being simply a manifestation of Trump’s amorality and at best his tangential relationship to reality, it really is his ongoing gaslighting project in trying to replace reality with his own fantasy. In chapter after chapter Welch makes this case for why the basic Trump insecurities bend him so firmly in this direction. Not that any of this is news, even if there’s now a better name for it all. Welch makes the case for the chicanery of Karl Rove and provides vivid examples from the McCain campaign against Obama as well. In the Cold War generation, the “big lie,” is much the same thing. A fundamental of propaganda was that repeating the same lie often enough made the lie more real than the truth. Gaslighting, big lies, and other manipulations, including the Facebook mayhem from the Russians and now almost every country, are all part and parcel of the same problem. People can be easily manipulated by falsehoods in the hands of haters or authoritarian leaders. Now that we know the problem, how do we find the solution? This entry was posted in Ideas and Issues and tagged Bryant Welch, gaslighting, politics, psychology, Trump Administration by Wade. Bookmark the permalink.